Daled Amos: Why Is Saudi Arabia Suddenly So Shy When It Comes To The UN? Why Is Saudi Arabia Suddenly So Shy When It Comes To The UN? This month, it seems as if Saudi Arabia was getting bashful around the UN. Indeed, anyone tracking Riyadh’s actions rather than its words can easily see which issues it cares about and which it doesn’t: In contrast to its massive support for the Syrian rebels, or the $5 billion it pledged to Egypt’s military government after July’s coup, its financial support for the Palestinians is meager. UNRWA, the UN agency responsible for Palestinian refugees, gets almost all its funding from the West; Saudi Arabia gave it a mere $12 million last year–less than half the sum provided by Holland alone. Western states are also the Palestinian Authority’s main financial backers; Arab countries not only pledge less to begin with, but serially default on their pledges. Saudi Arabia, in an unprecedented show of anger at the failure of the international community to end the war in Syria and act on other Middle East issues, said on Friday it would not take up its seat on the United Nations Security Council. The kingdom condemned what it called international double standards on the Middle East and demanded reforms in the Security Council. These complaints go further than the reasons Saudi Arabia had earlier given for refusing to speak at the UN. Does that mean that these reasons are all authentic? Mordechai Kedar addresses the question The Saudis: brave and moral or manipulative and self-serving?. Kedar notes that first, there are cultural issues behind the Saudi refusal. But the main reason for their refusal to join the Security Council is the fact that Saudi Arabia continuously undermines the security of many countries: it funds Sunni terror in Iraq, its billionaires grease the operations of hundreds of Jihadist militias operating in Syria, and the Saudis use their many petro dollars to spread radical Wahabi Islam throughout Europe, Africa, Asia and the Americas. A seat on the Security Council contradicts such activity and could place the Saudis in embarrassing positions. And embarrassment is the last thing a Middle Easterner can tolerate, except shame. Given their fundamental clashes over human rights, Israel, and other issues, this relationship works best when diplomacy operates behind closed doors. If Saudi Arabia takes a public stand on a high profile issue against the U.S. perhaps the U.S. will respond with public scrutiny of Saudi Arabia’s dismal human rights record. This is why I suspect that the withdrawal of military equipment aid to Egypt may have had a sobering effect. Until recently, withdrawal of that aid was not deemed credible given Egypt’s strategic position. Now that this is in play, who knows what a potential public spat with the U.S. may lead to. Given that the relationship with the U.S. is a core interest of Saudi Arabia, I suspect they decided to better be safe than sorry. Unfortunately, such considerations don't seem to bother Arab tyrannical regimes like Iran and Syria -- among others -- that readily accept positions giving them a voice in the UN, and are openly welcome there by that august body. 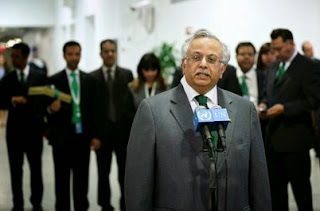 Technorati Tag: Saudi Arabia and UN and United Nations.